by Niall Douglas. Last updated 2014-07-27 17:52:18 +0000 UTC . This page has been accessed 11 times since the 26th March 2019. Sunday 27th July 2014: 5.52pm. I forgot to post my annual SSD vs magnetic hard drive capacity per inflation adjusted dollar graph which I updated in May, so here it is. 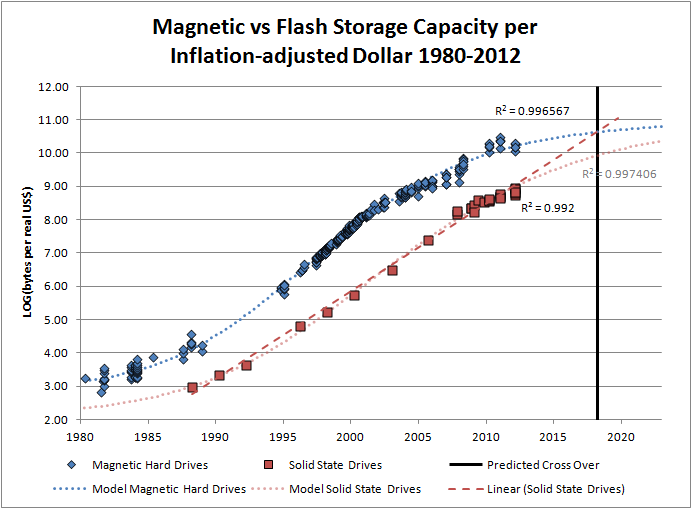 The trend of deexponentialisation of SSD capacity per dollar growth has continued as I first predicted in 2012 (http://www.nedprod.com/studystuff/SSDsVsHardDrives_201204.png), and currently SSDs are growing slower than magnetic storage which implies they will never catch up in terms of capacity per dollar. As much as the forthcoming memristor replacement for flash is not long out, in the end Moore's Law is going linear right now, so the exponential growth of effective transistor density will end no later than 2018 or so. The consequences of deexponentialisation of hardware improvement will be a major shock to the world economy and the death of quite a few big silicon design vendors, but probably will be very good for the software programmer as there is at least twenty if not thirty years of software improvements made economic by stagnating hardware growth, and we'll be the only ones capable of delivering that, so expect wages to rise still further from now and a whole new software bubble as if it were the 1990s all over again.